Real estate is a lot like golf. It looks easy … until you try it. 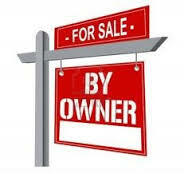 As a FSBO, your home just sits there and gets only the exposure you give it, e.g., newspaper ads, yard signs, etc. Unfortunately, these forms of marketing rarely work in today’s Internet age. I can’t speak for all Realtors, but the majority that I know and deal with on a day-to-day basis won’t even bother attempting to contact a FSBO owner. Why? The MLS already has 90% of all homes on the market and each one comes with a commission to entice the Realtor to bring the homeowner a buyer. Compare that to what you’re offering. A handshake and pat on the back are nice, but they won’t pay the bills. Yes, you could offer to pay a Realtor who brings you a buyer a commission, but the problem with that is, no Realtor will ever know that. Realtors simply assume FSBO’s won’t pay a commission or they already would be listed. More importantly, a Realtor’s commission on the MLS is guaranteed in writing. Verbal FSBO promises aren’t legally binding, so unless you have something in writing no Realtor will even listen. There’s no reason why you can’t have the same Realtors who are currently ignoring you, come beating down your door to bring you a buyer for your home. Most of the homes I come across are overpriced. FSBO’s usually rely on online estimates from Zillow.com. Zillow with its Zestimates are not accurate. Zillow comes up with a mathematical formula based on what it thinks the owner has a mortgage and other external factors to guess its market value. What if you were a homeowner whose home had foundation issues, Zillow would never be able to figure how much "blemish" ie. price adjustments to take on the property. What if your home backs to a private creek, or your home has a boat dock that leads you into the private lake? Zillow would not be accurate in these examples. In addition, as a regular homeowner that does not work with buyers often, how do you know how much "premium" today's buyers would pay for such amenities?The problem with these websites are they’ve never seen your home. A computer has no idea if you put in marble floors from Italy or if you just painted your home florescent green — both of which would dramatically impact the price of your home. The #1 thing that sells any home — whether it’s large or small, new or old, worth $75,000 or $7.5 million — is price. if you price your home even a few $1,000 dollars above market value, it will sit. And sit. And sit. Have you ever been shopping at a car lot eying a nice shiny car, but then the salesman shows up and starts following you around asking if you need any help, or if there’s any questions he can answer? If you’re like me, the moment the salesman shows up, all you want to do is tell him to please leave you alone so you can just look in peace, or run to your car and drive off. Buyers get a similar feeling when they visit FSBO homes and the actual owner is present (it’s even worse when the homeowner gives the home tour). Not only do buyers feel almost queasy inside, they tend to clam up and wait until they get outside of earshot. In the meantime, there’s a lot of smiles and friendly nods, but inside, buyers are dying to get out so they can discuss their true feelings about the home. Compare that to when buyers walk through a home with an agent where they can discuss the good and bad points about the home openly and immediately … and in peace and quiet. I understand why FSBOs do this. You really have no other choice. You certainly don’t want to let complete strangers wonder through your home unsupervised. Realtors on the other hand can guide buyers through a home and keep on eye on them at all times, as well as openly talk about and point out the home’s strengths. The point is, nobody wants to hurt someone else’s feelings, so buyers in FSBO homes hurry through the home and then start talking outside. They also are far less likely to open closets, look in closed rooms, check out every room, or sit down on the couch and imagine themselves living there if the seller is right there watching them. In other words, buyers never get a chance to emotionally connect to a FSBO home. And unless that happens, you have almost no chance of ever getting an offer. FSBO sellers usually don’t understand all that goes into a successful real estate transaction. What contract works best? How much of an escrow deposit should be required for a particular transaction? What must the seller to with the deposit once received? What title company should be used? What is a title company? When a buyer threatens to back out of the contract (which happens frequently in real estate) how does the FSBO owner keep the deal together? What disclosures and addenda must be used to protect the seller against future lawsuits? The list goes on and on and on. As a Realtor, I can tell you that making sure your i’s are dotted and your t’s are crossed is worth its weight in gold. I deal with contracts and legal forms everyday and trust me when I say that you don’t want to handle these documents by yourself. Our forms and contract are constantly updated by groups of attorneys that make sure all parties are protected in the transaction. Generic contract bought and the store do not offer the same protection. When an agent is out showing homes to a client and sees a home that has a "For Sale by Owner" sign out, they may pull over and call the home. If the owner is not home, that is a loss opportunity. Will listing your home on the MLS with no marketing work? The buyer that goes to a fsbo site does not know your address. If you were to go to a site and search for your home like a typical buyer. You would realize that your home is buried and no one is really looking at it. Flat fee brokers take your money and list your home on the MLS for a LONG TIME, usually 6 months to infinite. There are properties listed by flat fee brokers in the MLS that have been on the market over 1500 Days! Flat fee companies are miles away from your home some as far away as Minnesota! If your home is on the MLS for 6 months, while you are making mortgage payments for 6 months are you saving money? They know that most realtor's will ignore there listings because they are not updated regularly have few photo's and you have to deal with the owner directly. Once your home has been on the MLS for a while, agents and buyers assume something is wrong with the home because is has been on the market for so long. Your listing becomes STALE and just sits and you get no feedback to see what could be changed. Agents and investor's assume that you are desperate and only offer you lowball offers. 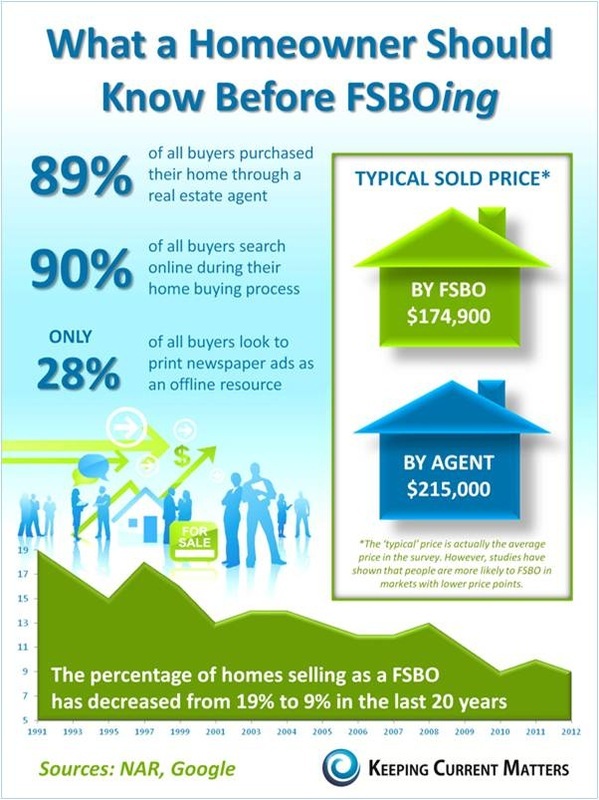 Conclusion There you have it, the biggest reasons why FSBO seldom sell. If your FSBO isn’t going as well as planned, you’re not alone. The average FSBO only has 3% chance of selling their home without a Realtor.